A considerable amount of thought and planning will undoubtedly go into the creation of your comprehensive estate plan. The same amount of thought should also go into choosing an estate planning attorney to assist you with the creation of your plan. At Kobrick & Moccia, we understand how important your finished estate plan is to you and your loved ones. Our estate planning attorneys are committed to providing our Smithtown, New York clients with the time and attention necessary to create a personalized estate plan that meets all of their needs and wishes. The modern day town of Smithtown – which was originally known as “Smithfield” — has a wonderful legend that explains the town’s beginnings. The legend goes all the way back to 1665 when the area in question was still inhabited by Native Americans. When a Native American Chief’s kidnapped daughter was rescued by a man named Richard Smith, the chief offered Smith title to land to show his appreciation. The amount of land the chief offered, however, was to be determined by how much land Smith could encircle in one day riding a bull. Smith set out on the bull on the Summer Solstice, the longest day of the year, so that he could ride as long as possible in one day. According to legend, the land on which the town of Smithtown sits roughly approximates the ride Smith took that day on the bull. In honor of Smith’s bull ride, a large anatomically correct statue of Smith’s bull, known as Whisper, can be found at the fork of Jericho Turnpike (New York State Route 25) and St. Johnland Road (New York State Route 25A). Smithtown, New York is located in Suffolk County along the north shore of Long Island. The town occupies roughly 110 square miles which is almost equally divided between land and water. As of the 2010 Census, close to 120,000 residents call Smithtown home. The town’s history remains part of its appeal to visitors to this day. Along with the statue of Whisper the Bull, several homes and buildings that are on the National Register of Historic Places (NRHP) can be found around town that offer a glimpse into the area’s rich and lengthy history. Residents and visitors to Smithtown can also enjoy numerous outdoor parks and walking trails along with various dining and shopping options in the various Smithtown villages and hamlets. 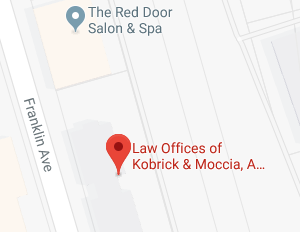 The attorneys and staff at Kobrick and Moccia are honored to serve the residents of Smithtown, New York with their estate planning needs. We are keenly aware that your choice of estate planning attorney is one of the most important decisions you will make over the course of your lifetime, prompting our commitment to help every client develop an estate plan that protects the client, their assets, and their loved ones. Moreover, we believe in creating lasting relationships with our clients because estate planning should be an ongoing endeavor. It is rare that an initial estate plan remains sufficient over the course of the creator’s lifetime. Typically, as you pass through the various stages of your life, your estate plan will need to be reviewed and updated to mark the changes that occur during those stages. A Last Will and Testament may be the extent of your initial estate plan when your biggest concern is not leaving behind an intestate estate. When you have a spouse and/or minor children to protect and provide for, you may wish to incorporate additional estate planning components such as incapacity planning, a trust to protect your children’s inheritance, and probate avoidance strategies to ensure the assets you leave behind are immediately available to your loved ones. With the growth of your estate assets, you may need to consider asset protection techniques and begin merging your retirement plans with your estate plans to ensure that the two plans work in harmony with each other. Finally, as you near retirement age, Medicaid planning will likely be included in your comprehensive estate plan. The estate planning attorneys at Kobrick & Moccia would be honored to help you create and update your individualized estate plan to ensure that everything and everyone that matters to you is protected. If you have specific questions regarding your estate plan, contact an experienced estate planning attorney at the Law Offices of Kobrick & Moccia by calling 800-295-1917 to schedule your appointment.